Whooping cough has spread across Spokane County during the summer, surprising health officials who expected numbers to drop once kids left school. “It is a miracle that we haven’t lost an infant yet,” said Kim Papich, spokeswoman for the Spokane Regional Health District. Also called pertussis, whooping cough is treatable with antibiotics, though Papich said the biggest concern is secondary infections such as pneumonia.One in four infants with whooping cough gets pneumonia, Papich said. And about two-thirds will have slowed or stopped breathing at some point during the illness. The highest number of cases during this year’s pertussis epidemic – 40 per month – were recorded in July and August. And the rising trend has not shown any signs of slowing. There have been 138 confirmed cases in the county. Another 59 were suspected of having it, according to the health district. Eleven people have been hospitalized with whooping cough. There were four fatal cases in the two previous years. Papich said the numbers are never concrete because symptoms of whooping cough do not show up for two weeks after a person is infected, and the telltale sign of the disease is a cough that lasts at least two weeks. 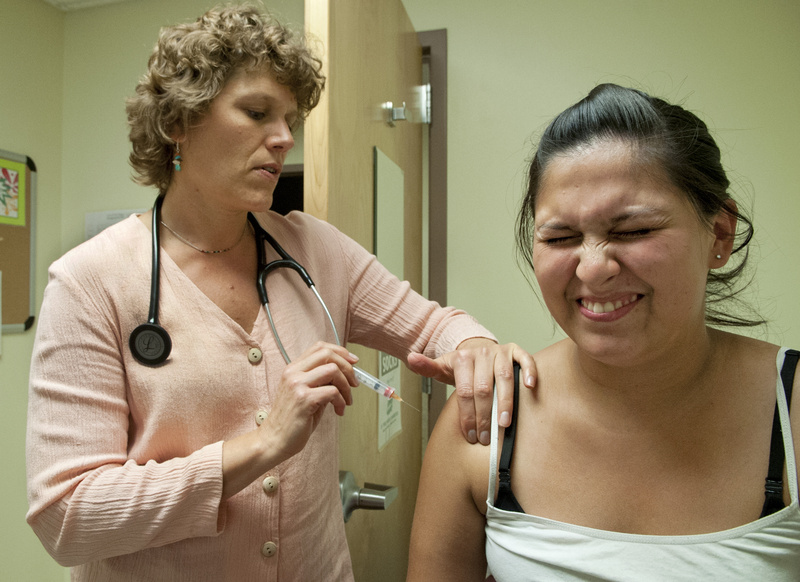 At the NATIVE Health of Spokane clinic on the city’s North Side, family nurse practitioner Sandy Schilling urges everyone who hasn’t had a recent pertussis booster to get one. “We don’t even know how effective the (pertussis) vaccination is in protecting people, and for how long,” Schilling said, underscoring a stubborn problem of stopping the epidemic. The original versions of the pertussis vaccine came with many side effects, she said, from fevers and seizures to swelling at the site of the injection. Within the past decade, the vaccine given is not as strong but doesn’t come with the severity of side effects as its predecessor. By the age of 5, kids receive five doses of the DTaP vaccine, which is a combined vaccine for diphtheria, pertussis and tetanus. Schilling said kids should get vaccine boosters by age 10, and adults should get a Tdap vaccine booster as soon as possible, especially if they interact at all with children – even if they have recently had a tetanus shot. Some children ages 7 to 10 have contracted the disease as the vaccine appears to have worn off in some cases, she said. The health district said this year’s patients have ranged in age from 1 month to 77 years old. Of those ages 18 and under, 58 percent were up to date on their vaccines, 17 percent had at least one vaccination but were not up to date and 25 percent were not immunized. Papich said about 97 percent of children currently enrolled in school in Spokane County are immunized, but there are no solid numbers for how many adults are immunized. “We know it’s less than 80 percent or we wouldn’t have a whooping cough epidemic,” she said. The problem is not unique to Washington. The Centers for Disease Control and Prevention reported 27,550 cases of pertussis nationwide in 2010. Papich said many cases go unreported as initial symptoms are similar to a cold or influenza. The cough often sounds like a distinctive “whoop” in children, hence the name whooping cough. It’s also expensive – between $300 to $400 – to test to confirm someone has whooping cough. Schilling said antibiotics are important in combating the disease, and anyone who is in direct contact with someone known to have pertussis should also be prescribed antibiotics. As a result of the state and county declaring whooping cough an epidemic earlier this year, the vaccine is offered for free at many clinics for uninsured or underinsured patients. A complete list of clinics offering the vaccine can be found at srhd.org.